Buffalo boasts many attractions, from sports teams to unique culinary offerings. The city also once was a shopper's paradise, and those fond memories live on today for generations of locals. Buffalo native Seymour Knox helped his cousin Frank Woolworth open his famous chain of stores nationwide, and Cresbury Clothes remained a multigenerational family business for most of the twentieth century. Well-recognized national chains, like the A&P, and local department stores like AM&A's and Sattler's were among the great retailers that dotted the main streets of the Queen City. Others, like Tops Markets, were bought out by larger corporations. 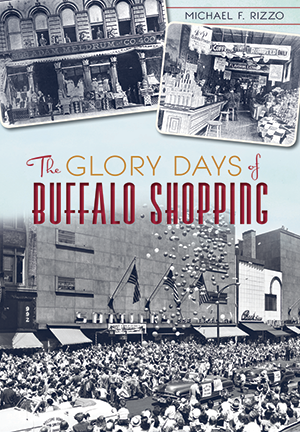 In this new, updated edition, join Buffalo native Michael Rizzo as he revisits the days when Buffalo's streets were lined with stores and its sidewalks crowded with shoppers. Michael F. Rizzo owned Naked Buffalo Tours for six years. He has published five books and written articles for The Buffalo News as well as preservation grant applications for the City of Buffalo. He has spoken at the Buffalo & Erie County Historical Society, Lancaster Historical Society, Polish Genealogical Society and City Hall.